This day belongs to funkiblink. Vintage quilted vest donated by Siri at Treehouse Brooklyn. Visit her store at www.treehousebrooklyn.com. Vintage faux fur hat from Beacon's Closet and pumps from eBay. eBay will match every dollar you donate during this holiday season up to $15k. If you've been waiting to donate, now is the best time. I'm first!!! almost at 100 kids! hooray to fun fridays. This is a very premium look for you today. 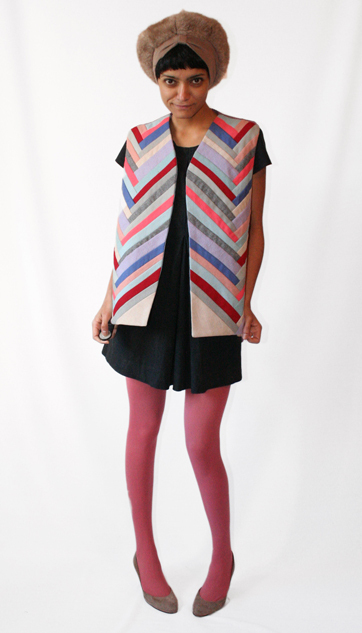 Love the colors head to toe, but just not feeling the shape (or lack of) the vest . . . But hurrah for 99 kiddos being funded for education! That VEST IS AMAZING!!! And I'd bet that most people would take one look at it and think, my grandma would wear that. And here you are rocking it like Vogue-don't-know-how-to. Stop with the hats. What are you? An 80-year-old woman coming home from the salon? GREAT to give us a goal of $63,000. I would be sure to post that on the site so people can see the goal number! I will donate now! So cute! Those quilted vests aren't usually something I look at and go "ooh, adorable," but you have made this one just that- adorable. Perfect title for this outfit! I'm glad that hat is faux. I really like those pumps and that hat. So cute. A belt around the waist would have made this outfit, though, in my opinion. sorry not up to your normal high standards. hmmm....I am really sorry sheena but do you have a muffin on your head? new yorker. tagged this work it. That vest was created for someone twice your size, and it does not make the grade. Love the clourful vest but agree with Maria that it is spoiling your lovely shape, never mind ...let the money come in & meet our target for those poor kids. only u could pull a look like this off.....and bravo sheena!! I would've put "Try Harder" except I just got back from a World Music Day event, and I'm getting some of that vibe from the thing on your head and the vest that creates a horrible silhouette. Love the tights and shoes though. Like the tights & shoes, but sorry: not the rest.... I donated anyway. scary. tagged this nice one. 100 kids !! wooot! congrats loveeens! Anonymous tagged this chevrons ahoy! A 100 children!! Wow...hope you're partying tonight. Very, very proud moment. P.S: not loving the vest. Loving the numbers! congrats on 100 kids in school! The vest reminds me of those chains we would make out of gum wrappers! The hat is a bit dowdy, though. From the neck down it's really cute. I disagree with some of the negative comments about the vest--I think the "V" shapes add geometrical interest and the colors with the pink tights are great juxtaposed against the plain black dress. What I HATE HATE HATE is that atrocious hat. Ugh. Please, get it off of your head because it isn't cute or hip or anything else. It just ruins the look. Not feeling the vest, but the hat is MONEY.